To answer some of your questions as quickly as possible, we’ve compiled a list of those most frequently asked by Branchville parents. Be sure to read more throughout this website and in our student handbook so that you’re well-informed and prepared to support your child through a successful educational journey. You will find a copy of our student handbook on the Our School page. How do I enroll my child at BES? What are the school hours at BES? Does your school offer breakfast and lunch? Does BES allow visitors during the school day? How will your school ensure my child’s safety? Is visitor parking available at your school? Where should I enter the school? Will my child have access to the Internet while on campus? We are always happy to welcome new families to our learning community. Please visit our Registration page for the information about enrolling your child at one of our schools. Classes start promptly at 8:35 a.m. each school day. Regular dismissal is at 3:25 p.m. except on early release days, when we we dismiss at 11:40 a.m. Please remember that parents may drop off their child no earlier than 8:50 a.m., as there is no adult supervision available before that time. If your child must miss school, please email or call our nurse, Judy Gallagher, at (203) 894.5528 ext. 31603 within 48 hours of the absence. We may require signed notes (and possibly other documentation) for students with total absences (unexcused and excused) in excess of nine for the school year. For more information about our attendance policy, please visit our Attendance and Truancy page or refer to our student handbook. A parent or guardian must sign out and pick up students at the front office if they need to leave before our regular dismissal time. Yes. Each school supports an excellent nutrition program with healthy and balanced meal options. You may view menus and nutritional information on our Nutrislice page. Ridgefield Public Schools is pleased to provide students at each of our schools with safe, reliable transportation to and from school each day. 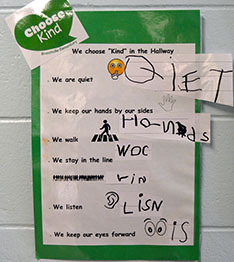 We expect all students to adhere to the rules for their own safety as well as the safety of others. For information on bus policies, schedules, and routes, please visit our district Transportation page. We welcome parents and community members to be a part of our school community in many capacities. For security reasons, we require all parents or other visitors to first sign in at the security desk and wear a visitor’s badge while in the school or on school grounds (i.e. the playground). Visitors do affect the classroom environment, so we only allow authorized persons to come into our classrooms. We authorize parents to be in classrooms when teachers invite them to visit or volunteer. Parents may not go to classrooms, therapy rooms, the health room, the cafeteria, or to our playground without prior authorization from the principal and without a reason to do so that is acceptable to the teacher or principal. The school nurse, upon written authorization of a health care provider, may administer over the counter and prescription medication. We will administer medication in accordance with state regulations and with physician and parental approval. Please visit our district Registration page to view and complete our medication authorization form. Parents and guardians must bring medications to the front office in the original, labeled packaging. PowerSchool is just another way we keep communication between home and school strong. It provides you with almost real time access to your child’s grades, attendance history, and other important information. To receive your login information, please call the front office or email our helpdesk. Your child’s safety is extremely important to us. To help keep everybody safe, we ask that all visitors to our campus follow our security procedures. Visitors must enter the school grounds via the main entrance and show a photo ID. We will provide a temporary photo ID to wear while on our campus, which will expire at the end of the school day. We ask that visitors check out when leaving the school. Thank you for your support of this important security procedure. Yes, the visitor parking at our school is clearly identified within the school parking lot. We ask all visitors to park only in visitor spaces to avoid a fine or ticket that may result by parking elsewhere. We ask that all visitors to our school enter only through the main entrance. Only staff members may use their ID badges to enter through other entrances. Students can access the Internet for homework and school-related research from our computer lab, library, and some classrooms under the supervision of qualified school personnel. We require all students to abide by our Acceptable Use Policy (which can be found in our student handbook). We expect our students to behave responsibly on school computer networks.